Talk appears as a window at the bottom of your desktop. The top part of the window features a summary of the defined function keys. Function keys can be programmed either to do actions within the program such as Help or Muting the voice, or as phrases to be spoken. There are a number of actions you can program. The lower portion of the window allows you to type in phrases which can then be spoken any time you like. Phrases can be repeated any time, just by using the arrows to navigate to the phrase and pressing Enter to speak it. You will want to add your own function key phrases for things like your address, telephone number, favourite expressions etc. You can do this in the Talk Options dialog in the box marked Function Key Phrases, just click on one of the buttons to add new phrases or edit existing ones. If you don't like having part of your screen used to display the function keys, you can get rid of this display in the Talk Options dialog by turning off Show Function Keys Help. You can repeat any phrase you have typed by placing the caret (the vertical bar) anywhere on the phrase and pressing enter. If you only want to say part of a phrase you can do that by highlighting the part of the phrase you want to read with the mouse (or by holding the shift key and using the arrows on the keyboard.) If anything is marked, pressing Enter will read it. You can delete a phrase by putting the caret at the start of a phrase and holding the Del key until it is entirely deleted, or you can use the mouse or keyboard to mark what you want to delete and then press the Del key once. You might want to organize your phrases into topics called Conversations to make them easier to manage. You can have one for home, one for at school, one for with friends, and so on. 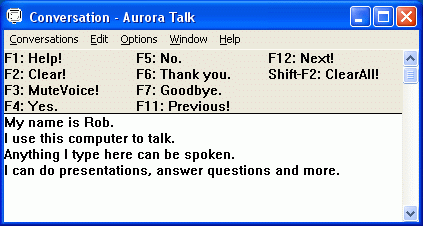 Aurora Talk allows you to switch between conversations quickly and easily with F11 and F12. Find out more by reading about conversations. If you didn't select a speech synthesizer during startup or you get an error message when you try to speak, you will need to select a synthesizer in the Voice Options dialog. You can get to that dialog by choosing Options from the Talk menus, then Voice Options... You can also get to Voice Options by right clicking anywhere on the Talk window. If you find that certain words are mispronounced by your speech synthesizer, you can correct the pronunciation of words in the Aurora Voice Options dialog with Edit Exception File. To learn more about Talk, see What is Talk.